For those of you out there who have used the task scheduler for Linux called Cron, you might be pleased to find out that a similar program -- VisualCron -- has been developed for Windows. 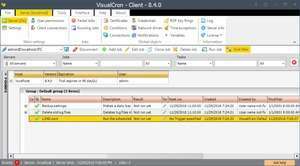 VisualCron is a handy task scheduler and planner which is remarkably easy-to-use. Not only is the program well designed and pleasing to the eye, but their own web site contains tons of useful tips for people wanting to setup Cron for Windows. The way VisualCron works is it will perform tasks at an exact set tie. VisualCron 8.4.2 is a shareware program and can be used as a demo to try the software until the free trial period has ended. A full version of the program is available after the trial period ends. For security reasons, you should also check out the VisualCron download at LO4D.com which includes virus and malware tests. Additional screenshots of this application download may be available, too.